Birthday parties at Classic Thyme are as much fun for parents as they are for kids!! Take photos, enjoy your child's special day, and most of all leave the planning, facilitation and clean up to us. We offer four types of birthday parties: "Chef for a Day," "Recipe for a Bear," "Chocolate! Chocolate! Chocolate!" and our new "Cooking with the Kids." Each party offers multiple menu items to choose from. Parties run from 1 1/2 to 2 hours and are led by our experienced children's class instructors. Parties are for ages 3 and up and we require a minimum of 10 attendees. Except for "Cooking with the Kids," our parties are "drop off" parties; we request that only the parents and immediate family of the birthday child remain during the parties. Our newest addition, "Cooking with the Kids," is designed to have parents join in the fun of creating culinary memories with their children. 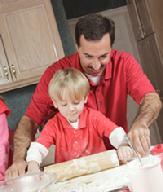 Parents bond with their children and other parents while cooking together and enjoying the results of their activities. For a detailed brochure on each of our party offerings, please click on the photos. Classic Thyme Party offerings are also available for school, camp and scout troop outings. Please call our school at 908-232-5445 to schedule your next party. Click here for a "Cooking with the Kids" brochure. Please follow the links to down-load specially designed invitations and thank you notes for our parties.